The pharmaceutical industry is facing challenges and changes more radical than any in the past 50 years. The worldwide economic recession has had a profound impact on a sector that is normally resilient to market ups and downs. In addition to cutting costs and restructuring, the industry has had to confront the fact that its trading environment has fundamentally changed because its customers are more cost conscious than ever. At this critical time, the pharmaceutical world has also stumbled upon the so-called patent cliff: R&D pipelines have not been able to produce a sufficient supply of replacements for blockbuster drugs that have lost patent protection. Hence the door was thrown wide open to generic drug producers to do what they do best—provide low-cost alternatives to branded pharmaceuticals. In addition, over the past two decades, advances in biotechnology have led to a generation of biologic medicines that are often more efficacious than traditional small-molecule drugs at treating their target diseases. The oldest of these biologics are now losing their patent protection too, offering yet another opportunity for the manufacture of generic copies (in this case, called biosimilars). A new analysis by BCC Research examines strategies used by companies specializing in generics to meet the challenges of this highly competitive market, while also summarizing strategies used by “originator” companies to forestall generic competition. Initially, generics suppliers relied initially on low cost as their main market advantage. It was a potent strategy, as government health departments in most European countries operating national health schemes began to introduce measures designed to curb pharmaceutical expenditure. In the United States, developments in managed care had a similar effect. Everywhere, these cost-cutting exercises favored generics. However, the low-cost argument that was the main rationale for generic products began to work against the commercial promise of this industry sector. Competing to introduce low-cost copies, generic drug makers were driven to undercut each other to the point where, a year after patent expiry of the original brand, the mean price of copycat products may have fallen to less than 20% of the original. In addition, generic price competition was fueled by government reimbursement measures, which favored low-cost drugs and thus tended to trigger further price cutting among generics contenders. This development had two far-reaching effects. First, it began to weed out the weaker generics companies in favor of those with the means and the resolve to exist in an environment where profit margins were severely cut, often to less than 10%. One survival strategy adopted by these companies was to broaden their appeal beyond mere cost cutting, to include, for example, “super generic” products with added value, often because of special delivery formulations. The second effect was to lead some of the mainstream multinational pharmaceutical companies that had been developing plans to enter the global generic marketplace to reconsider this strategy. Generics no longer seemed such an attractive option, and some companies reverted to their core activity of developing and marketing new pharmaceutical products. More recently, there has been a trend toward price increases in the generic sector. As such, while continuing to offer a price advantage over original brands, generic drugs have become more attractive to the companies offering them. However, there is also opposition, as was discussed at the ECCO Congress 2017 (held in January) and reported by Medscape. 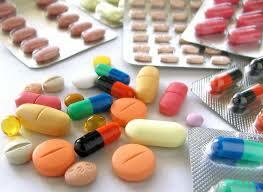 In the United Kingdom, some generic cancer drugs have increased in price by 1,000% in recent years. Andrew Hill, PhD, from the University of Liverpool, United Kingdom, and his colleagues documented huge price increases for many generic cancer drugs commonly used in the United Kingdom from September 2011 to September 2016. The research team used three databases: Drug Tariff, British National Formulary, and Prescription Cost Analysis. There is hope that new legislation now passing through the UK parliament will prevent such huge price increases in the future. The Department of Health has introduced the Health Services Medical Supplies (Costs) Bill to regulate prices in the future, and companies found to be raising prices with no clear justification will be referred to the Competition and Markets Authority. Spain and Italy have argued against the higher prices demanded for generics and have even taken legal action, but the companies threatened to stop supplying the generics drugs unless the higher prices were agreed upon. Dr. Hill said that companies are getting away with this because they take over the manufacturing of a particular drug and then have a monopoly. “In a proper competitive market, this should not be happening, and I think that Europe needs to work together as a region, rather than each country for itself, as the market is much bigger,” he added. The British Generic Manufacturers Association (BGMA) agreed with the observation about companies having a monopoly; with the exception of hydroxycarbamide, none of the generic products in the list compiled by Dr. Hill and his colleagues face competition from multiple suppliers. That is because the total market size is too small to be attractive for generic companies to enter. If they were to do so, they would not recoup the million-pound-plus costs of developing, testing, and registering a new generic medicine, it said. Also at ECCO, Melissa Barber, MPhil, from Cambridge University, United Kingdom, reported on a World Health Organization–supported study of the manufacturing costs of cancer drugs. Because most generic drugs are made in India, the cost of the active pharmaceutical ingredient was calculated based on the Indian price of the drug. Excipient and conversion costs were added, as was a 10% profit margin that accounts for a 26.6% average tax on profits. Even with these additions to manufacturing costs, it was found that several key generic cancer drugs could be manufactured for less than 1% of the prices charged in the United Kingdom and the United States. One example is imatinib (Gleevec; Novartis), used for the treatment of chronic myeloid leukemia. At present, the cost per 400-mg tablet is $0.22 in India; the cost-based generic estimate that Barber and her colleagues calculated is $1.04. This contrasts with current price per tablet of $57.53 in Spain, $84.36 in the United Kingdom, and $247.74 in the United States (at Veterans Affairs prices, which are discounted). 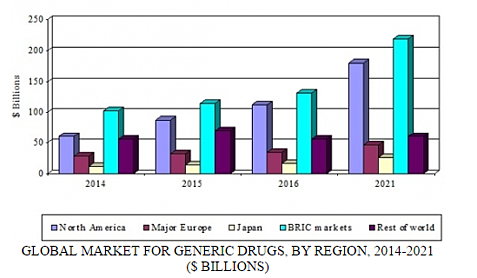 The global generics market was valued at approximately $320 billion in 2015. Among the countries analyzed in a new BCC Research study, the generics market is worth more than $249 billion. Of the latter figure, the five major European markets (France, Germany, Italy, Spain, and the United Kingdom) account for 13%, the United States for 33%, and Japan for 6%. Generic penetration varies widely from country to country. In Europe, for example, generics account for almost 22% of the German pharmaceutical market by value and for 25% in France. The Western European average share is nearly 21% compared with 19% of the US pharmaceutical market and 14% of the Japanese market. In terms of volume, the generics share is much higher, but it is difficult to generalize with any accuracy because price differentials vary from country to country. Also, the price of a generic copy may be roughly 60% of the original brand immediately after patent loss, whereas after a year, when several generic copies have been launched, the average price may be less than 20% of the original. This means that the value/volume ratio is continually changing. By 2021, BCC Research expects that the total value of the global generics sector will exceed $533 billion, representing more than 35% of all pharmaceuticals. Overall, the global generics market seems likely to increase at a five-year compound annual growth rate of 8.7%. This compares with anticipated annual growth rate of 5.5% for the pharmaceutical sector overall. BCC Research’s new study, Global Markets for Generic Drugs, discusses the implications of important trends by product categories and major markets, acknowledging that Brazil, China, India, Mexico, and Russia are among the rising markets for generic activity. The nature and structure of the generics industry is discussed, with profiles of major players and an update on merger and acquisition activity. Five-year sales forecasts are provided for the national markets and the major therapeutic categories of products involved.